More simple interactive content in WordPress (or Moodle)? Many teachers are left in the cold when it comes to adding interactivity to their online resources. Just upload a PDF document and everything will be fine. But the web lends itself to interactivity and there is no reason why we can’t make more use of online interaction. When it comes to the web we often find it really easy to over complicate things, especially in the world of technology with HTML, CSS, HTML5, Flash, WebGL and every other flavour of web development code. Sometimes it is nice to just create something simple with very little code that you can drop into your WordPress page or into a Moodle page and let people use it. 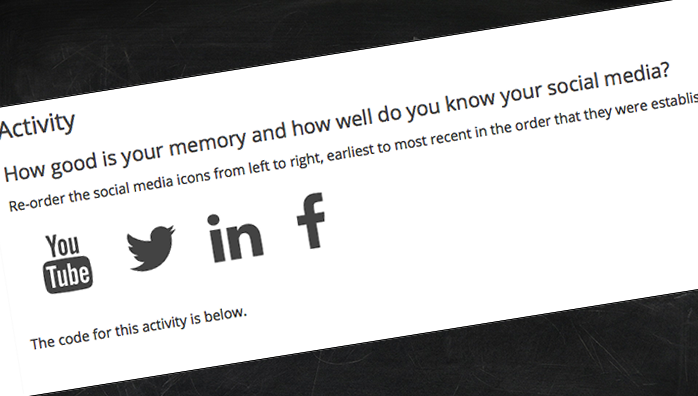 How good is your memory and how well do you know your social media? Re-order the social media icons from left to right, earliest to most recent in the order that they were established. The code for this activity is below. If you have some ideas you want to try, send me some details and we can have a chat about how we could make your idea work in WordPress or in Moodle.